In order to be the most effective in preventing or controlling horse parasites, it is best to take a two-pronged approach. Horse wormers are often rotated so there is no chance for resistance to develop. Using maybe an Ivermectin then a Benzimidazole or a Pyrimidine. (Personally I just use Ivermectin 3 times a year) Some use a daily feed additive, which is effective, though you still need to use a botavele (Ivermectin) at least twice a year. According to the OSU extension service, a horse will need to be de-wormed several times a year. You would start this at about 4 to 8 weeks of age. (Use caution and read labels, some wormers are toxic to foals!) Chemical parasite treatments are most effective when used around the time conditions favor hatching of eggs or developing of larvae. Remember, there is no de-worming strategy that fits all horses. Things such as climate, humidity, rainfall, stocking sate of pastures as well as the age of the horse, can determine what strategy you need to use in controlling horse parasites. If you have questions about this it is important to ask your vet or local cooperative extension. Always be sure to isolate and worm any new horses. If the manure in your life isn’t managed, it can cause a BIG stink. (No pun or philosophy intended) Seriously though, this is an area that often isn’t thought about in controlling horse parasites. Manure management or parasite control is one of the easiest ways to help your horse program succeed. No matter how small or large that program is! Interestingly enough, the same things that are effective for controlling horse parasites, also helps your pasture. It’s a win-win situation. If horses are kept in stalls, it is very important that the stall be kept clean! Larvae (from worms) have even been shown to climb the walls in the stall where they can be picked up by the horse. Definitely, in my opinion stalled horses need to be wormed regularly. When the manure is removed from the stall it should either be composted (where the larvae will be destroyed by the heat) or spread on pastures not being grazed at the time. Composting isn’t just piling it up; there’s a whole big procedure to it. Rotating your pastures helps them not becomes over-grazed. Horses will not choose to eat close to their manure piles, unless there is nothing else to eat. When a pasture or lot becomes over-grazed, the chance for ingesting parasites goes through the roof. Even if you’re on a small acreage, you can divide the lot/paddock in half and set up a system that way. When you move the horse to the next lot, you would want to drag and mow the previous one. This breaks up the piles exposing the larvae to direct sunlight and heat. Also, the bonus point is, you just fertilized your pasture via the manure. All it cost you was time. We have a small lot by our house (roughly 150' x 200’) that I sometimes keep a horse in that is too small to drag. When I move a horse or cow off of it, my son Ricky and I have a poop-kicking contest. This breaks up the piles (destroying the larvae in time) and fertilizers the grass. The Bermuda in that lot at times will be knee high and thick as dog hair. 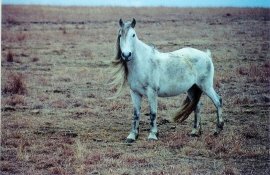 Another strategy that can work well with controlling horse parasites, is called alternative grazing. This is where you graze horses in a pasture, then cows, then drag. This can really turn a good pasture an excellent one. Regular rotations of pastures – no matter the size! (This allows for recovery of forage as well as cuts down the worm burden. If possible pasture cattle, sheep or goats behind horses. (In an alternate rotation) these species will ingest the infective larvae. These infected larvae (being host specific) will then be made inactive. Keep stalls clean, composting or spreading the manure. Mow or drag your pastures. This will break up the manure piles and, during the hottest and driest times of year, kill the larvae. It also really fertilizes your pasture. Avoid overstocking/overgrazing as this will increase the horses risk of ingesting infective larvae. When possible, use feed trough/pairs as well as a hay rack. Feeding your horse grain /hay on the ground, increases the risk of infestation. For more information on controlling horse parasites, please contact us.